Things that match the energy you are emitting. Now, I know you may think this is a “hippie thing” from the 60s, but it's not. It's based on science and is one of the strongest laws in the Universe - the Law of Attraction. To use the Law of Attraction for money is to use a very strong magnetic force that draws money to you if you can get your energy in harmony with it. And once you figure out how to use this strong magnetic force for money, you've actually found something that's even better than just being able to generate money. It's important to speak both symbolically and energetically to your subconscious and to the Universe because by doing this, you're "speaking the correct" language. COMMITMENT: You'll want to commit yourself to the process because one necessary piece of information to manifest money is that there is a time lag between emitting the energy and the response, so bear this in mind when starting your process to manifest money. Also, the Universe responds energetically to commitment. All things are possible when you commit to something because your commitment attracts your desires. LET GO: Let go of your past inability to earn or receive money. You're starting new now and using one of the strongest forces in the Universe. When you let go, you're trusting that things are working out, which keeps your vibration in line with receiving what you desire. BELIEFS: Be sure that your core beliefs around money are positive. You can try affirmations to manifest money, but if your internal beliefs about money are still negative, you've got a long haul ahead of you. One way I can help you with this is through The Effective Positive Thinking Program which is specifically geared to help you erase many of society's “negative beliefs” around money and then inputs positive money beliefs. MONEY AFFIRMATIONS: Once you figure out where your core beliefs stand, then do money affirmations to start “priming the pump” of energy within yourself. INCREMENTAL STEPS: Your internal energy reserve – and vibration – moves up slowly like a barometer. Realizing this is key to figuring out how to manifest money fast. If you shoot too high and unrealistic in the beginning, you'll soon become discouraged. Take it slow and steady. ENVIRONMENT: In addition to using manifesting money affirmations, another little known trick is to make your desires “physical.” One way to manifest money fast is to use printable fake money as I did when I manifested money in a week. Also, keeping money quotes all around yourself helps your energy figure out how to attract more money. But, I take it way further than just doing a vision board. I have found a significant secret to speaking symbolically to my subconscious mind and to the Universe that makes it "real enough" for the Universe to get the drift of my desire and I discuss it in detail in The Effective Positive Thinking Program. TRICK YOUR MIND: Here's the best tip of all... Use things like subliminal money meditations that instill new thoughts – and energy – into your subconscious mind directly, without being “discredited” by your conscious, or critical, mind. This is probably the best solution to attracting more money because your subconscious becomes that homing pigeon I spoke about earlier. When you can directly change your subconscious mind through positive subliminal messages, you have the key to how to manifest money because you have been able to reprogram your “computer” to seek out "more money" on a unconscious energetic level. The fun part about this is that it all works automatically in the background. It's your auto-pilot. When you have mastered changing your subconscious beliefs and energy around money, you have mastered how to attract money on new levels. So, that's why I've included in The Effective Positive Thinking Program silent subliminal affirmations that directly target a lot of the "poverty-mindedness of society beliefs" we unconsciously absorb. Well, in the Manifest Money part of the program, you learn how to systematically create energetic momentum to attract money using various "energetic exercises," brainwave meditation and silent subliminal affirmations to you can become that "homing pigeon" for money. How to "talk the language of the Law of Attraction" by using energetic ways to increase your attraction. Why symbolism is key when trying to convince your subconscious to make change. How to use symbolism to make it "so real" that the Universe has no choice but to change your current reality to fit it. How to develop both sides of the brain for "whole brain functioning," to improve intelligence and intuition. How to find answers within yourself about your core money beliefs. How to disarm your doubts. Why affirmations many times fail, particularly when the affirmations are centered around money. How to give yourself permission to dream and find your true desires in life. How to identify common pitfalls to avoid when using the Law of Attraction. How to encourage creativity to gain momentum through exercises using two of the best money printable worksheets: 1) Printable fake money; and 2) Manifesting money checks. How to anchor in emotional feelings for energetic consistency and maintenance of vibration. THE BEST energetic trick for using the Law of Attraction for money that already resides in your body. THE ONE KEY secret about using the Law of Attraction that many people miss or "laugh off," but is essential to really making it work. Quick Start Guide PDF. This quick start guide helps you streamline getting started with the program. The workbook explains why it is important to do energetic exercises to create your desired vibration when working with the Law of Attraction for money and gives the tiny nuances that are many times overlooked, but are critical to your success. It includes exercises to help you get focused and committed and helps you understand why it's important to "think differently than over 90% of the population." This energetic guide explains how you can face and disarm your doubts, rather than running away from them or suppressing them. Most importantly, this guide sets you up for the 8-Week Exercise Program Guide portion of the program. "There are a variety of effective ways to build your energy to manifest money. I have used a combination of things at various times over the years, all of which have worked for different reasons. However, through these experiences, I have clearly found the small nuances that consistently make the Law of Attraction work. It is these small nuggets of truth that I intend to pass along to you within this program as well as the larger variety of energetic ways that invoke the Law of Attraction so you have a wide “arsenal” of techniques to experiment with and find which ones work best for you. All of the nuances and techniques are delivered to you through a simple eight-week outline of suggested activities for systematically building your energy to manifest money. Some of my exercises may feel a bit unconventional or even radical, but if you can open your mind up to the “energetic purpose” of each exercise, you'll understand the fundamental purpose of this program... which is to align you energetically with that which you desire. The whole point is to shift your energy because even though you feel like you're “flesh and blood,” you're really just a bunch of vibrating molecules that are attracting similar vibrating molecules. So, if you're feeling uncomfortable with something at first, it means that your “molecules” are bound to get a good energy shift by doing the exercise and overcoming that energetic hurdle. During these eight weeks, you are given exercises and suggestions that shift your energy little by little while building momentum over the course of the eight weeks to change the trajectory of your financial future. 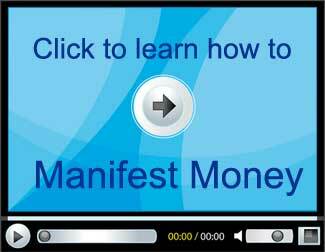 Manifest Money Meditation mp3. This meditation download is the best meditation for helping you coax your subconscious to gently open up and make change. It includes money affirmations to manifest money as well as ones that "target" many of society's lies about the lack of money and poverty consciousness that we absorb from the majority of the population. The program also includes a variation of this meditation that you can use as you go to sleep at night which fades out while in the Theta state instead of bringing you back up to an alert state of mind. Daytime (Invisible) Affirmations Subliminal Manifest Money Audio mp3. When you talk about subliminal mind control, this is “where it started.” While we think our ears can only “hear what is audibly heard,” it has been proven through testing deaf subjects that there is a portion of the ear that “hears” frequencies that we do not think are audible. Like a dog whistle, for example. This affirmation download has the same money affirmations as the Manifest Money Meditation, but the affirmations have been converted so they are not audibly heard by the conscious (or critical) mind. Manifest Money Sleep Meditation mp3. One of my favorite ways of inputting new beliefs is to play subliminal recordings while I sleep. So, this recording has affirmations that have been converted so they are not audibly heard. It also has soft tones that soothe you to sleep and brainwave entrainment that does not require headphones. It contains the same money affirmations as the Manifest Money Meditation. Quick Start and Workbook Audio mp3. This audio gives you both the quick start guide and the workbook in audio format for convenience and portability. Traps and Common Pitfalls to Avoid When Using the Law of Attraction. All of the subliminal downloads provided in this program contain the same affirmations that help you overcome many of today's beliefs about lack and poverty that are so ingrained in society. This program teaches you how to build your energy to attract money as well as gives you meditation and affirmation tools to help make it easy. When you know how to "energetically" speak to the Universe, you have the power to truly attract your desires! When you want to manifest money, it's important to remember that you must speak the language of the Universe, which is energy. Learning tangible ways to shift your physical vibration to come into alignment with your desires is a necessary part when you are manifesting money.